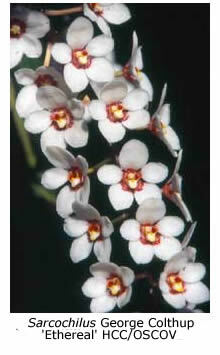 Most Sarcochilus (pronounced Sar-co-kyle-us) orchids are native to Australia; only one species is found overseas. The most widely grown species (Sarcochilushartmannii, S. fitzgeraldii and S. ceciliae) grow on rocks in New South Wales or Queensland. However all three of these species grow happily in pots in Melbourne shade houses. Another species (S. falcatus) is found growing mostly on tree trunks, and is best grown on mounts, such as pieces of tree branch. 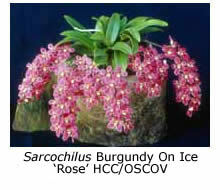 Many hybrids have been made in recent years using the above four species, and also some of the other sarcochilus species that are less amenable to cultivation. In many instances these hybrids show hybrid vigour and are even easier to grow than their parent species. POTTING. 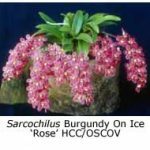 Sarcochilus are best repotted during their most active growing season, which commences in March and continues into early winter, when the plants rest until they flower, mostly in mid- to late spring. Sarcochilus ceciliae and some of its hybrids flower a little later, usually during summer. 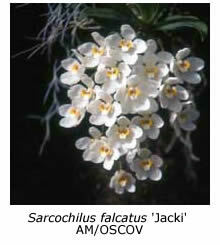 Most sarcochilus species and their hybrids are best potted in a mixture of pine bark pieces (5-10 mm diameter) and river pebbles of similar size. Approximately two parts of bark to one of pebbles gives good results. Well-drained plastic ‘squat’ pots are ideal. 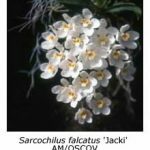 In the case of Sarcochilus ceciliae (and to a lesser extent its hybrids) the plant should be placed high in its pot – it seems to do best if its roots are allowed to wander over the surface of the mix rather than penetrating into the mix. LIGHT, TEMPERATURE AND AIR. 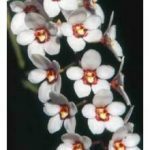 Sarcochilus orchids enjoy breezy, shaded, humid conditions and do best lower down in a shade house or fernery than other orchids, such as Australian native dendrobiums. WATERING. These orchids require plenty of water when in active growth but during Winter, when they cease growth, watering once each week is ample. FERTILISING. Regular applications of liquid fertilisers at no more than half the concentration recommended by the manufacturer stimulate growth during summer and autumn. They should be used less often during spring and not at all in winter. FLOWERING. Care should be taken not to wet the flowers when watering, especially in dull, still weather. Sarcochilus flowers tend to spot very readily due to the growth of Botrytis (Grey Mould), which is most prevalent in damp conditions.